Just to clear a few things up, Evan Williams Kentucky Straight Bourbon Whiskey is not named for Celtic’s goalkeeper in the 1970 European Championships, Evan Williams, who, despite playing a decent game, gave up what turned out to be the game-winner to the Dutch team Feyenoord in the 117th minute. Evan Williams Bourbon is also not named for social media tycoon Evan Williams who started Blogger, that “other” free blogging platform (see, I got your back, WordPress), sold it to Google, and then CEO’d another little internet venture called Twitter for a number of years. This internet-age Evan Williams and I actually have a lot in common, we both live in San Francisco and are both incredibly wealthy, or rather, he lives in San Francisco and is incredibly wealthy and I just live in San Francisco. 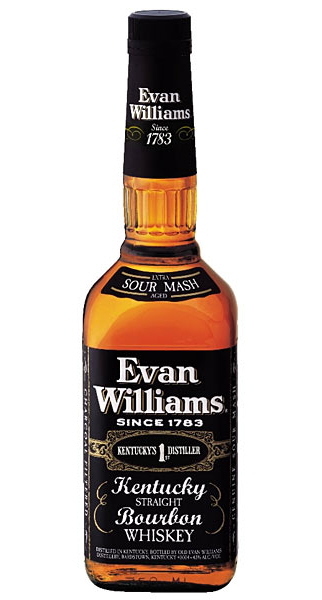 No, Evan Williams Bourbon is named after a rather jack-of-all-trades-ish Welshman who after settling in Kentucky, was one of the first to make his own hooch in the late 1780’s near Louisville. The Evan Williams brand was introduced by parent company Heaven Hill in 1957 and quickly became one of the countries most popular bourbons. Today, this still popular “Black Label” expression is joined by the lower proof “Green Label”, the 100 proof “White Label”, the Single Barrel, the small batch “1783”, and three whisky-liquour types things, the Cherry Reserve, the Honey Reserve, and the Southern Egg Nog (yikes). The Nose: A spice and fruit nose, vanilla, cinnamon and a bit of clove mixed with sweet orange, a bit of cantaloupe and a touch of baked apple dessert. There’s just a little bit of a solvent-y, corn oil whiff but it’s slight and not really off-putting. This is not a super rich or complex nose it’s but interesting enough and decently nuanced. The Palate: A carmelized, slightly syrupy beginning quickly shows the rye in the mashbill with more vanilla bean, cinnamon, and clove. Towards the end, there’s a slightly harsh quality to the woody dryness that emerges and a surprising amount of charred and smokey wood, and but overall, it’s relatively smooth. Again, not super complex but very palatable and smooth for the price point. The Finish: The rye still comes through as does the cinnamon, clove and the charred wood quality. Thoughts: I contemplated making this a “Bargain Bin Friday” entry, but it warrants more respect than that. Is this a marvellously complex, rich bourbon? No, not really, but for $9 – $10 a bottle, were you really expecting it to be? Given that there are far worse bourbons out there occupying the same lower shelves for the same amount of money, Evan Williams deserves a shout for being what it is, a solid, well-made, satisfying bourbon that works well in cocktails, is great for baking & cooking when you actually want to use decent stuff, and actually holds its own as just a sipper…a truly excellent value.